Earn a degree in dental hygiene from a nationally recognized university! The Ohio State University has the only dental hygiene program in Ohio that is affiliated with a dental school. 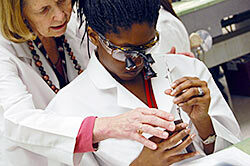 A four year program leading to a bachelor of science in dental hygiene (BSDH). Includes two years of general education courses and program prerequisites followed by two years in the professional program. 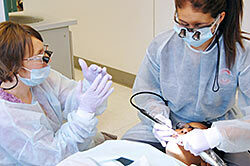 Learn more about Entry Level Dental Hygiene Program. 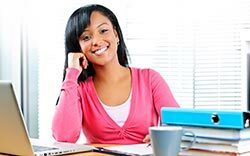 A flexible, online program for licensed dental hygienists who already hold a CODA-accredited associate degree and want to earn their BS in dental hygiene. Learn more about the Degree Completion Dental Hygiene Program. A two year online course of study designed to prepare dental hygienists for a career in dental hygiene leadership & education. Learn more about the Dental Hygiene Master's Program. Fully accredited by the Commission on Dental Accreditation.